*Put your own spin on these by adding anything that you would normally like on a pizza just before popping them in the oven! Start by laying each tortilla out individually on a flat surface, and use an empty can, cup, or cookie cutter to cut 3-4 medium circles out of each wrap. I used the empty pizza sauce can, which worked well! Press firmly enough, using a rocking motion, until it cuts through the wrap. Meanwhile, pour pizza sauce into a medium sized bowl…. And the spices. Stir until everything is well combined. Place 4 mini pepperoni’s on top of each pizza. 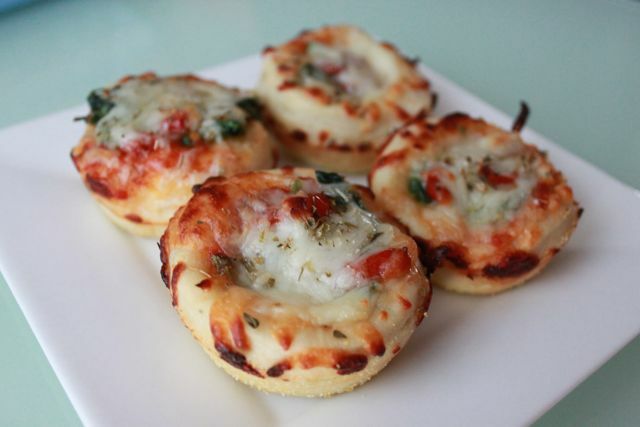 Wait for pizzas to cool, and remove from muffin tin using a fork or knife.